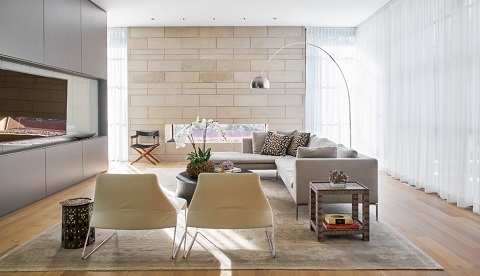 A lot of talk about living room design is dedicated either to the big ticket items – like your sofa, accent chairs, and entertainment system – or to the big surface areas – walls, flooring, and area rugs. But while these elements combined make up the lion’s share of your living space, it ignores the one element that brings it all together: your lighting fixtures. Good lighting is what makes a living space usable, and though it might not be the first thing that comes to mind, decorative lighting fixtures are an excellent way to add personality to your space. One of the easiest ways to make sure you’re putting your living room in the best light is simply to incorporate a few more lamps into your space. Lamps are great to decorate with because they’re stylish, inexpensive, and easy to set up on your own. If you’ve got a shadowy corner, an afternoon of shopping and maybe an extension cord are all you need to add a bright, attractive accent to your space. Of course, lighting your living room only with lamps has a few significant drawbacks. Each one has to be plugged in and turned on and off individually, and their range is relatively limited; they’re great for providing light in targeted areas, but can be cumbersome in the numbers you’d need to light a large room. 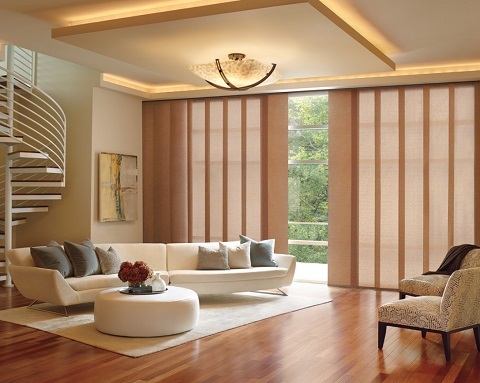 Recessed lighting has seen a big boom in popularity in the last decade, and with good reason: it’s one of the best, most effective ways to get quality all-over lighting throughout an entire living room or greatroom that you can control with a single switch. Installing lighting fixtures directly into your ceiling is certainly a much bigger project, but it’s among the best, most inconspicuous lighting you can get for a wide open room. Bonus? You can really use floor lamps and table lamps to showcase your style rather than just to get the lighting you need. 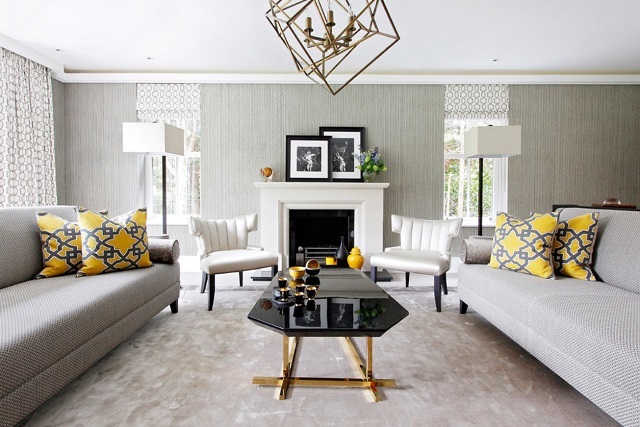 Symmetrically placed lamps or matching lamps scattered throughout the room are a great way to give the space a sense of coordination and a polished, designer feel. Better still, if you aren’t worried about relying on them for light, you can place them where they look best. Of course, you don’t have to rewire your whole living room to get good, all-over lighting. While recessed lighting provides an excellent baseline, it’s entirely possible to get a beautiful effect by upgrading the setup you already have. 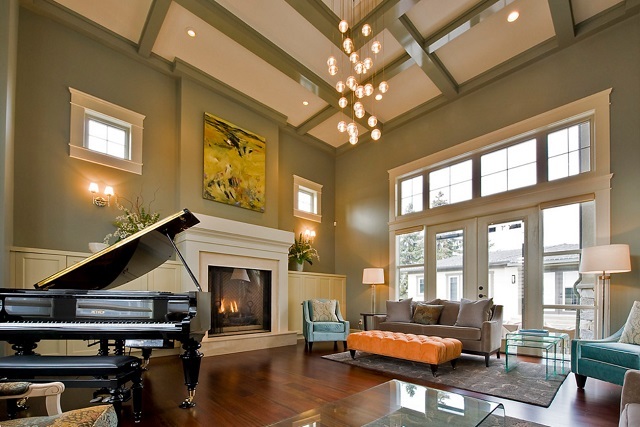 Most living rooms come equipped with a single lighting fixture in the middle of the ceiling – typically a simple flush-mount light controlled by a switch near the entrance to the room. Simply upgrading that fixture – either to a pendant or chandelier, or even just a nicer-looking flush-mount light, depending on the height of your ceiling – can turn a functional fixture into a decorative one. A few stylish lamps can also help enhance your decor, while supplementing the light in the shadowy corners of the room that a central fixture might not reach. If you’re feeling bold, you can also add a few accent lights (like either plug-in or hard wired cabinet lights) to literally highlight the features of your room, like display shelves or artwork. One of the major drawbacks of decorating with typical floor and table lamps is that they have to be plugged in. That means their usefulness is restricted in a few key ways: to where you can plug them in, to where the cord can reach, and to where the cord can be hidden without restricting walkways. There are ways around this, like hiding an extension cord under a rug, but in a large, open room, traditional lamps can present a distinct challenge. Arc lamps, with their long, curved design, offer a surprisingly ingenious alternative to a conventional floor lamp. The base of these lamps can be placed out of the way – near a wall and outlet – while the light itself is placed in a more prominent, useful location. Arc lamps can often be adjusted both in length and angle, giving you a high degree of control over your lighting placement, without having to alter your electrical work or fuss with cords and plugs. With the rising ubiquity of LED lights and the fall of incandescent lighting, it’s more possible than ever to control not only the quantity of light your living space gets, but also the quality – specifically the color. While standard incandescent bulbs have a warm, honey tone, standard LEDs can produce anything from a muted amber to a bright blue-white that closely mimics natural daytime sunlight. Which colors of light you choose (and which ones go in what fixtures) can have a huge impact on the ambiance of your space. Paired with old-school goodies like dimmer switches, three-way lights, or even natural candlelight or fireplaces, it’s possible to transform the same room from one that’s bright and energizing to one that’s cozy, dozy, and better for a night-time wind-down. If you don’t love the look of traditional can-style recessed lighting (or the resulting polka-dots of bright light on your ceiling), be aware that this isn’t your only option. Cove lighting keeps your built-in lighting fixtures hidden, typically around the edges of the room, or along the edges of a bumped-in or bumped-out area of your ceiling. Unlike can lighting, which shines brightly down on every part of the room, cove lighting provides soft, dramatic ambient lighting around the perimeter of your room, chasing back those pesky corner-shadows and adding visual flair to the outer edge of your space. Usually, you’ll want to supplement this type of lighting with a central fixture (either a flush-mount light, chandelier, or pendant), but this is a great way to get lighting into the hardest-to-reach corners of your living space without having to struggle with lamp placement (or manually turning individual lights on and off). While it may not be at the forefront of your mind, the lighting fixtures you choose can have a huge impact on the final look and feel of your living space. So really put some thought into it: What parts of your living space do you use most, and how and when are you in them? Where do you wish there was more light, and what features of your room would you like to be more prominent? 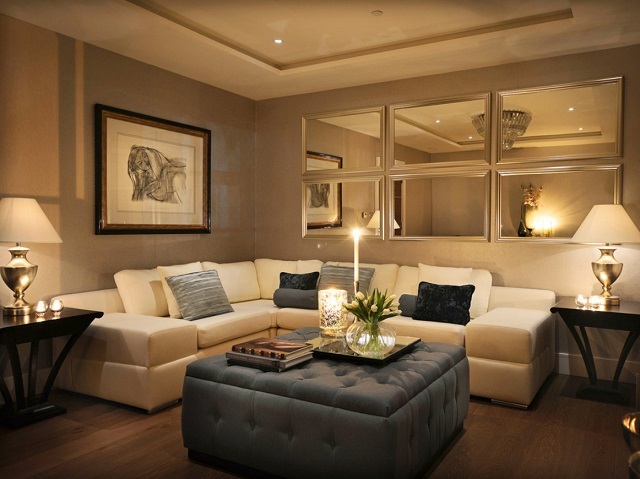 Really thinking about the ways that light impacts your space is the first step to a more polished, usable living room! This entry was posted in Decorating Ideas and Tips, Latest Trends, Lighting and tagged arc lamps, lamps, layered lighting, lighting fixtures, Lighting Ideas, living room lighting, recessed lighting.